Oh yes! This was what I always wanted. Fine is oh-so-fine. I love it. 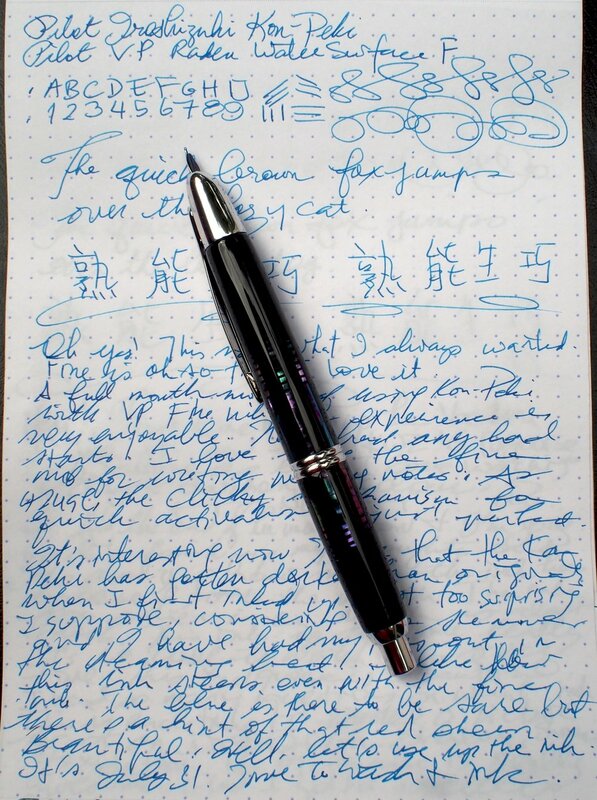 A full month of using Kon-Peki with VP Fine nib. The experience is very enjoyable. Never had any hard starts. I love using the fine nib for writing meeting notes. As usual, the click mechanism for quick activation is just perfect. It’s interesting now I see that the Kon-Peki has gotten darker than originally when I first inked up. Not too surprising and I have had my pens out in the steaming heat. I like how this ink sheens even with the fine nib. The blue is there to be sure. But there’s hint of that red sheen. Beautiful. Well, let’s use up the ink. It’s July 31. Time to wash and ink. Closing Comments Kon-Peki is an old favourite and I find myself coming back to it again and again. It’s a blue that makes me feel happy. I’m settling in with my nib preferences. It’s either end of the spectrum: fine or stub/italic. Since I use the VP mainly for meetings, I prefer the fine nib. Oh, I can always find a use for all the nib sizes and it’s definitely fun trying to match up the right ink with the right pen with the right paper. But there’s also something comforting in knowing I can pick up the VP with a fine nib as I head into a meeting knowing that it can handle whatever paper comes my way.